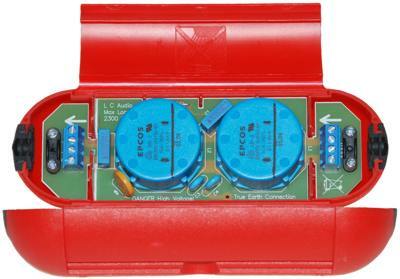 The purpose of this Mains Filter is to prevent RF noise to be carried to the Audio Equipment through the mains supply. It may originate from industrial machines, refrigerators, or other household appliances in the vicinity. The noise will be audible in your system, as a fuzzy sound stage, or pop noises in the loudspeakers. Several manufactures of this type of filter persuades customers to buy one mains filter for each audio appliance. But this practice is in our opinion only beneficial for You as a customer if you have equipment with very noisy switch mode supplies (that you might want to isolate from the rest). Otherwise we recommend one mains filter for all HiFi appliances, this way the RF coupling between the different components in your system is made through the mains wires, as intended, and not otherwise through the signal cables - with more audible noise as a consequence. A mains filter will always mean a little bit higher mains impedance. A poorly designed Class A/B amplifier with very limited power supply capacity might get problems reproducing a firm stable bass, if a mains filter is added to the system. However, most of the audiophile grade equipment (naturally including everything from LC Audio) will have no problems. Class A amplifiers can not distinguish between high or low mains impedances, as the always draw the same current from the mains wires, independent of the load. Therefore Class A amplifiers can always use a mains filter. PWM PWM or class-D based amplifiers like ZapPulse are likewise insensitive to mains impedance, and can thus (and is recommended to) also use a mains filter. Our mains filter is supplied with an electrical appliance box, and you should mount it in the wire of a normal mains distributor that you can buy in your local hardware store. The brown wire should be closest to the arrow on the circuit board (in both input and output sides). Also you can connect an Earth to our mains filter, if you have it available. Here we don't mean the third wire of your electrical installation. This earth is probably polluted with an abundance of noise from computers and other appliances in your vicinity. Therefore place a copper spear in your garden if possible, and feed a short (as possible) and thick as possible ground wire to the Ground terminal of the mains filter, and also to the casing of each of your HiFi components. This can sometimes really improve the sound quality of your system, and is fairly cheap to implement (when possible at all). Page Build Completed in: 0.175 seconds. .